Jakarta, July 6th 2015 - During the holy month of Ramadhan, Archipelago International as the leading hotel operator in Indonesia, is holding its annual Corporate Social Responsibility (CSR) event by helping to clean the Sunda Kelapa Mosque in Central Jakarta, and to distribute sweet treats across the region as ta'jil. The CSR activity named â€œSharing is Caringâ€ is conducted concurrently in 6 major cities in Greater Jakarta, Bandung, Surabaya, Yogyakarta, Balikpapan, and Bali and participated by all hotel units in the region such as favehotel, NEO, Quest, Harper, Aston, Alana, Kamuela as well as selected hotels like Aston at Kuningan Suites and The Grove Suite by Grand Aston. The cleaning of the mosque is carried out by most of the hotel units in Jakarta, communally cleaning the rest rooms and ablution areas in the mosque before distributing sweet treats to pedestrians and street vendors in the Taman Suropati area. At the same time, sweet treats are also given out to people who pass the Hayam Wuruk Street - close to Istiqlal Mosque. 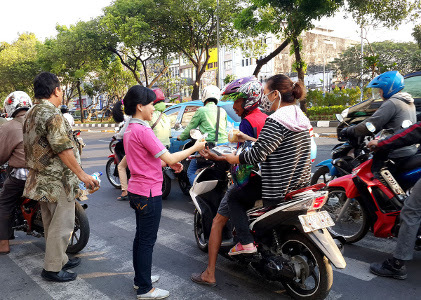 Whilst in Bandung, sweet treats are shared in Braga Street, Pasteur, and Dipati Ukur area to the the homeless and to bikers, drivers, and people in cars who are caught in traffic jams prior to the fast breaking time. In Yogyakarta, â€œTaâ€™jil on the Roadâ€ is held in Sagan area and Ngabean, whilst for Balikpapan - Kalimantan, sweet treats is given at the T-Junction of BC and Rapak, in Surabaya at Taman Bungkul and in Bali at the mosques in Kuta. The total number of sweet treats being distributed across the regions is more than 6000 packets from all of Archipelago International's hotel units. On the other hand, Archipelago International also visits the orphanage Yayasan Yatim Piatu Nurul Iman Jafariah in Menteng Jaya, Central Jakarta to enjoy fast breaking with the orphans. Furthermore, in Bogor, fast breaking is held in Islamic Boarding School Al Islami, Pabuaran - Bogor. â€œThe Sharing is Caring event is an annual event or activity that we hold during Ramadhan. Last year, Archipelago International also held breakfasting or â€œBuka Bersamaâ€ with the children of a local orphanage. Routine activities like these carried out by Archipelago International and our seven brands aims to share the joy and togetherness of Ramadhan, as well as strengthening the relationship between ourselves and the local communities.â€ Said Mr. Lukas Samali, VP of Human Resources - Archipelago International. Seen in the image : "Sharing is Caring" at Sunda Kelapa Mosque, Central Jakarta. Seen in the image : Distribution of Ta'jil at Hayam Wuruk street. Archipelago International brands include: favehotel, NEO, Quest, Harper, Aston, Alana and Kamuela. Archipelago Internationalâ€™s properties range from ultra-luxurious villas with private pools to select-service, economy-class hotels to serviced-apartment residences, thus offering Indonesiaâ€™s largest and most comprehensive hospitality network.